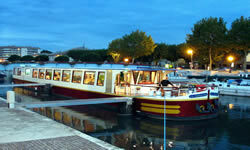 Transfer from a defined pickup point to Le Phénicien moored close to the ramparts of the walled city of Aigues-Mortes. It is time to settle in and explore the old fortress once a departure point for the holly crusades of the king St Louis, and now famous for its ambiance and shopping opportunities. Our first dinner on board gives an indication of the high standard of cuisine that will be served during the cruise with the accompanying wines specially chosen from local wineries. This morning you will meet your cycling assistant and get fitted to your bikes during an information meeting to go over the week ahead. You are now ready to take your first bike ride and explore the surroundings on small roads and trails along the salt fields bordered by canals, lakes and marshes where bulls, horses and pink flamingoes give an uncommon touch to the scenery. We will pull to the village of Le Grau du Roi and the beaches nearby where you will have your first picnic in a marine atmosphere. (30km). Back to the barge we start a peaceful short navigation to the village of Gallician where we will stop and stay overnight. The highlight of our ride this morning will be the Chateau d’Espeyran an unknown jewel of the French patrimony. During the guided visit we will discover a full set of original furniture on a site occupied since the VI century before J.C. On the way you will certainly enjoy the wildlife and particularly the great variety of birds found everywhere in this area. The Camargue never fails to surprise! (35 km). Back on board after a lovely picnic lunch we cruise the canal, the petit Rhône and the Rhône river to reach the Roman city of Arles, the open-air museum of Provence where Van Gogh painted 300 canvasses during his stay here in 1888. 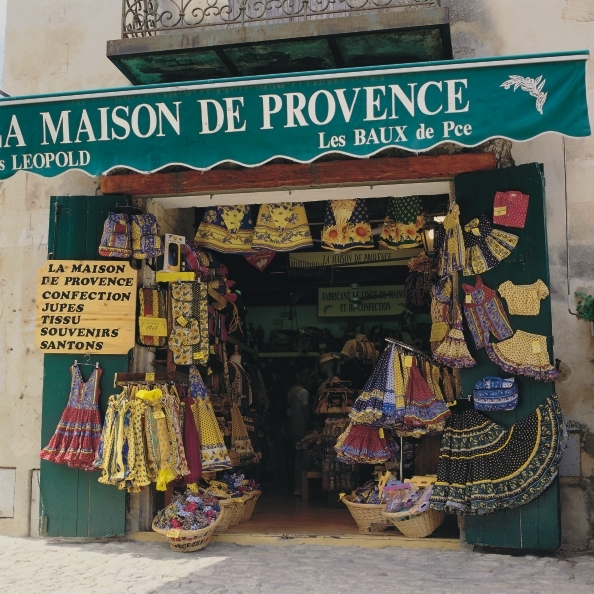 Enjoy the city of Arles this morning and its open Provencal market before we start a great ride towards one of the most beautiful villages of France, Les Baux de Provence where you will have a free visit and time for shopping. On the way we will make a stop at an olive oil mill in Mausanne and enjoy a lovely picnic. The ride back through the famous landscapes of Provence dotted with cypresses and olive trees will stay in your memories. We set sail this afternoon to our next stop, the charming village of Vallabrègues the capital of Basketry in Europe famous for its local craftsmanship. (50 km). Right after breakfast we head off on our ride to the Abbey of Saint Michel de Frigolet. Enjoy here a picnic lunch surrounded by the nice smells of our Provencal thyme, the best in Europe. Riding back to the barge the local charming villages along the way such as Boulbon or Barbentane offer a good spot for a little rest in the shade. And so on up the Rhône river towards the papal village of Villeneuve lez Avignon where we will stay for the night. (35 km). Our last bike ride this week will take us to the famous village of Châteauneuf-du-Pape once chosen by the Popes to grow the sacred vineyards. After a free visit of the village - and maybe a cautious wine tasting - we all get back on the saddles for a short ride to the barge awaiting on the Rhône river. You have lunch on board as the barge cruises gently down the river to Avignon where we will end up our journey. You still have plenty of time to discover the town where the Popes lived in the XIV century and take your last chance for shopping while the crew is getting everything ready for your farewell dinner! (35 km). After breakfast, you will be transferred to a defined meeting point. Transfer from a defined pickup point to Le Phénicien moored close to the papal village of Villeneuve Lez Avignon. It is time to settle in and explore the medieval village nearby. Our first dinner on board gives an indication of the high standard of cuisine that will be served during the cruise with the accompanying wines specially chosen from local wineries. This morning you will meet your cycling assistant and get fitted to your bikes during an information meeting to go over the week ahead. You are now ready to take your first bike ride heading for the famous vineyards of Châteauneuf-du-Pape. After a nice picnic on the way we reach the famous village once chosen by the Popes to grow the sacred vineyards. After a free visit of the village - and maybe a cautious wine tasting - we all get back on the saddles for a short ride to the barge awaiting on the Rhône river. 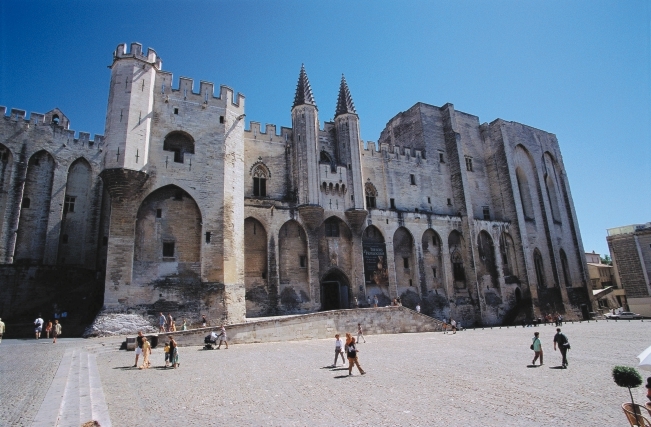 An afternoon navigation will take you to Avignon the town where the Popes lived in the XIV century and where we will stay overnight. (35 km). Enjoy your free time in Avignon this morning, the monumental Palace of the Popes and the city center are at walking distance from our port. Before lunch we set sail for the village of Vallabrègues the capital of Basketry in Europe famous for its local craftsmanship. Just after arriving in Vallabrègues we head off on our ride to the Abbey of Saint Michel de Frigolet. Riding back to the barge you will enjoy the nice smells of our Provencal thyme, the best in Europe. Charming villages along the way such as Boulbon or Barbentane offer a good spot for a little rest in the shade. (35 km). We set sail this morning to Arles the open-air Museum of Provence, on the way passing through the huge 36 foot high lock of Beaucaire. We arrive early enough to let you enjoy Arles’ large open air market and a free visit of the Greek then Roman city where Van Gogh painted 300 canvasses during his stay here in 1888. After a refreshing lunch on board you will take a bike ride to the twin cities of Beaucaire and Tarascon, their castles and two millenaries of History. (40 km). Everybody is warmed up now, so this is the right time for a longer morning bike ride to one of the most beautiful villages of France, Les Baux de Provence where you will have a free visit and time for shopping. On the way we will make a stop in Mausanne and its Typical Provencal market and enjoy a lovely picnic. The ride back through the famous landscapes of Provence dotted with cypresses and olive trees will stay in your memories. We are back on board for a great piece of navigation towards the Camargue on the Petit Rhône river and the canal. (50 km). We will start cruising deeper into the Camargue this morning and reach our final destination Aigues-Mortes. From there we will explore the surroundings on small roads and trails along the salt fields bordered by canals, lakes and marshes where bulls, horses and pink flamingoes give an uncommon touch to the scenery. We will pull to the village of Le Grau du Roi and the beaches nearby where you will have your last picnic in a marine atmosphere. (30km). Back to the barge in the afternoon you will still have plenty of time to discover the walled city of Aigues-Mortes from where the King Saint Louis set sail for the holly crusades of the XII century. The Camargue never fails to surprise and welcomes us for our farewell dinner! - *Wine Appreciation Cruises are available for charter groups at a supplement $670 per person. A minimum base of 9 passengers is required Please contact us for itinerary. - *Cooking Cruises are available for charter groups at a supplement $920 per person. A minimum base of 9 passengers is required Please contact us for itinerary. Avignon to Aigues-Mortes direction only. Maximum 15 passengers. A different bike ride is proposed everyday with the assistance of a cycling specialist. Each biker will be given a road book with the detailed suggested itinerary(ies). The daily average bike ride is about 35 km (50 km in the middle of the week). A longer trip (50 to 80 km) is proposed as an extension of the basic ride for serious bikers. The itineraries are mostly flat or reasonably hilly and will be ideal for bikers having similar rides about once a week. We do not recommend this program to people who never bike. Accommodations with private bath and lavatories, all meals on board and picnic luncheons off the barge, wine with meals and open bar, use of the facilities of the boat, availability at no extra cost of pickup and drop-off transfers between specified meeting points and the barge, one week all-road bike rental with helmet and repairing tool kit, road book with daily suggested itineraries, availability at no extra cost of a cycling assistant, unless otherwise specified. Drinks from the bar, air and train transportation, hotel before and after, airport taxes, health or accident insurance, trip cancellation insurance and baggage loss (all strongly recommended). Items of a personal nature such as passport, laundry, purchases or gratuities for the crew.